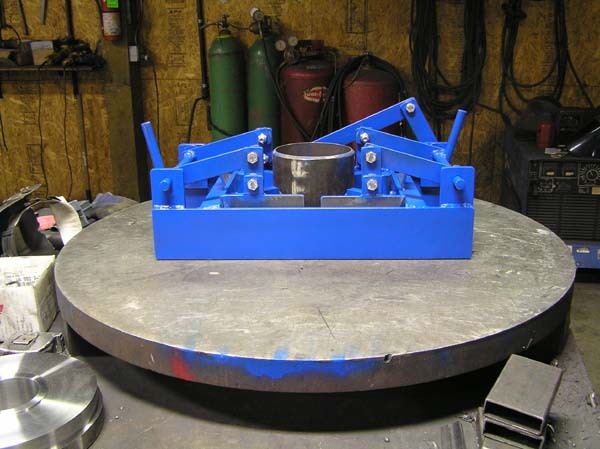 Copyright © 2011 TekMark Industries Inc.
Casing Alignment Clamps are used to align steel casing before welding. Note: Prices include one set of slips. Heigth is to top of linkage. Handle is removable and can be installed at either end of holder. Model Size is dictated by the maximum casing size that will fit into a particular Holder Frame. Note that slips designed to fit a small frame size such as 4-8 are less expensive than the same size slips to fit Model 4-26. Some drillers prefer to have several different sized models particularly if they have multiple rigs. Kit varies according to what components you have and what components you need. The most expensive Kit would be a kit to convert a 4 ½” Lifter to a 24” Lifter: ($1996) while a conversion kit to convert a 4 ½” Lifter to a 5 9/16” Lifter would cost $443. We will quote the proper conversion kit(s) to match your desired capability. 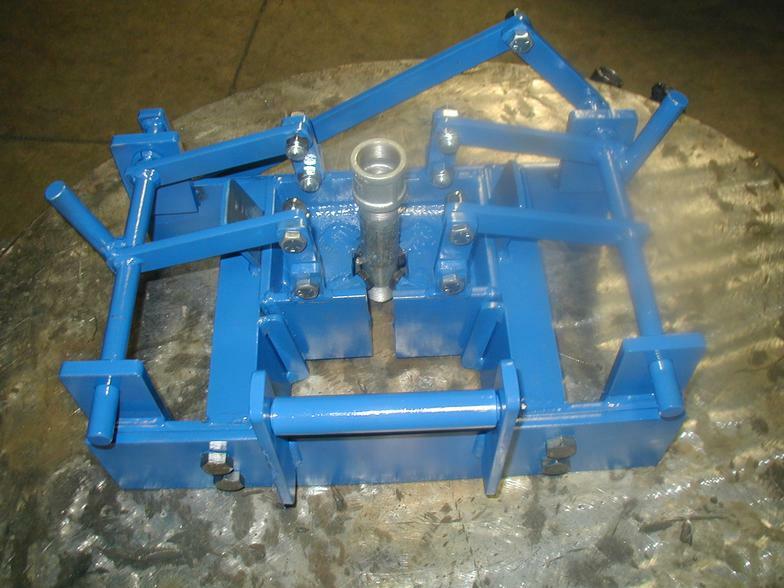 Casing Lifters can be ordered with wedges that have double the normal number of wings. This allows the driller to double the number of slips. This is desirable when exceeding 25,000 lb. loads in order to prevent the casing from deforming. Operation: you would attach drop pipe to top of lifter bail and attach 1/8” cable to bail. You will need enough drop pipe and cable to reach the depth in the casing string where you wish to activate the lifter. The guide point will be on the tool when you get it. You will lower tool down bore hole until the lifter cap assembly comes in to contact with the casing. The lifter cap is the same size as the casing I.D. so it will not go inside of casing. Once your at rest in the casing you will push down on drop pipe and then pull back. This operation will cause the small hook on the lifter cap to disengage from the small horizontal bail. The lifter has an internal spring which forces the slips out to the casing wall. As you pull up on the drop pipe the lifter slips will push out harder and harder. The maximum capacity of the tool is 70,000 lbs. but the pull back limits will be determined by the strength of the drop pipe. 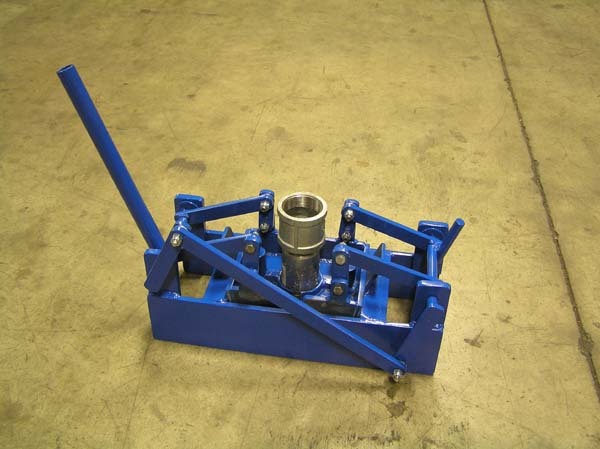 Other options are available for this tool which can provide up to 70,000 lbs pull back capacity. The price of this tool with the drop pipe configuration is $300 more than the normal Lifter Prices. Contact TekMark for pricing of other configurations. Provides a positive grip onto the casing wall. The carbide teeth bite into the casing. Works on PVC, steel and stainless steel flush joint casing and screen. Size (Casing O.D.) Price Capacity: 30,000 lbs*. This tool works off a drill string or drop pipe and a 1/8” cable. When you pull up on the drill string or drop pipe the lower section wedges the top section and exerts outword pressure on the PVC, steel or iron pipe. If you wish to extract the tool you pull up on the cable which is attached to the top section and the tool while pushing down slightly on the drop pipe or drill sting and the tool will be released so you can lift it to the surface. Can be used to set liner down hole. If a tool joint connection such as 2 7/8” IF Box or Pin or 3 ½” API Reg is needed at the top of tool instead of a column pipe connector please add $350. Capacity when using drop pipe well be determined by the strength of the drop pipe threads. Conversion Kits--available from any size to any other size listed above. The price of each conversion kit varies according to what components you have and what components you need The most expensive kit would be a kit to convert a 4 ½” Spear to a 24” Spear; ($1996) while a conversion kit to convert a 4 ½” Spear to a 5 9/16” Spear would be. $558. We will quote the proper conversion kit(s) to match your desired capability. Operating Instructions--The TekMark Casing Spear attaches to the drill string or pipe joint. It has a release-position lock which can be activated before going down hole. This will allow you to run your drill string to the area where you wish to engage the pipe or screen. Once you are at the correct depth turn 80 to 100 psi of air on and then off. This will set the spear so you can pull the casing or screen. If for some reason you cannot pull the assembly then turn air on after taking the weight off the string. This will disengage the spear from the casing and then you can trip out of the hole by reapplying air after breaking each joint. Note: if you are under water you will have to apply 80 to 100 psi of air plus enough air to lift the water column in order to activate the spear. We recommend that you run the drill string wet when encountering water in the bore hole. If you are lowering the casing from the surface down the hole place the spear into casing and turn air on and then off to activate the spear and then lower the casing. Follow above instructions to release the spear and return to the surface. There are 4 of these ¾” carbide pads gripping the pipe, 2 on each slip. 24” X 8” X 8” to top of linkage. Handle is removable and can be used on either end of holder. 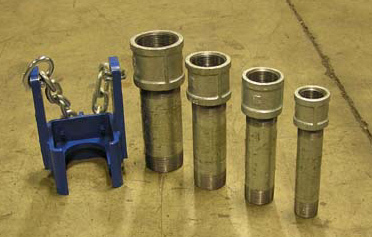 Slip sizes: include 1”, 1.25”, 1.5”, 2”, 2.5”, 3”, 3.5”, & 4” column pipe & A, B, N & H drill rod. Optional wire guide shown in picture above on right. With wire guide the holder is wider allowing space between slips and holder frame wall with a “Roller” guide mounted on holder frame wall . This guides the wire automatically as column pipe is installed or extracted. The TekMark Rod Slings comes with a shackle on the J Hook and two shackles on the Clamshell. 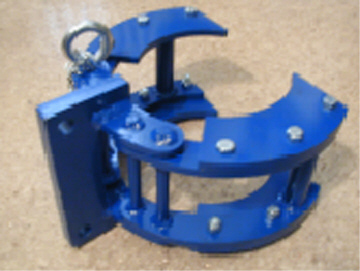 The J Hook and Clamshell are joined by a Wire Rope Sling - Single Leg 6x19 - 3/8" x 16' with a work load capacity of 2800 lbs. 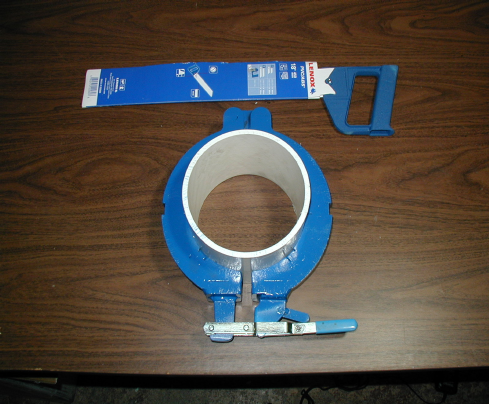 The Clamshell pictured is a 8 5/8” unit with 6 5/8” adapter plates attached. 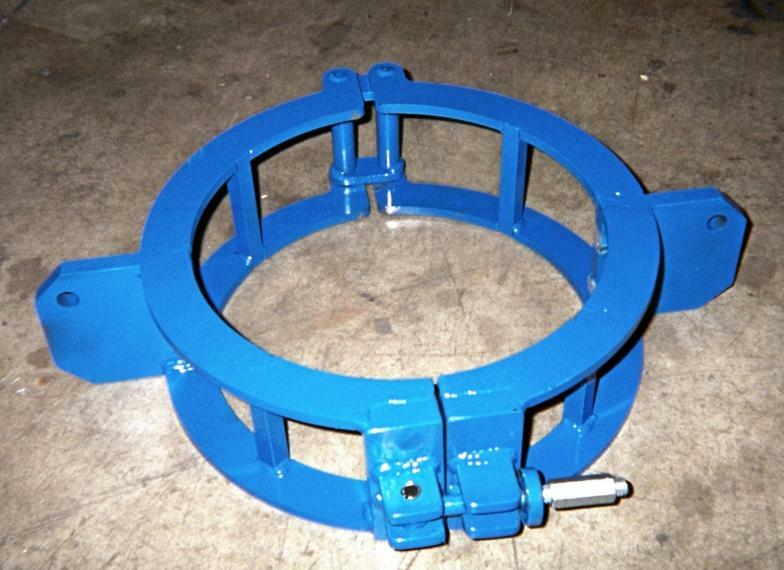 The Rod Sling assembly is rated at a working load of 2000 lbs. The Clamshell has a release pin that allows the clamshell to be spread apart when the pin is remove and holds the clamshell in place when installed. This feature allows the driller or drillers helper to install the clamshell around the casing and not have to thread it from the end of the casing. The J Hook is rated at a working load of 2000 lbs. and has a 7/8” shackle attached. We make these elevators with wings which are even with the top of coupling containment box so a pipe wrench can easily be placed on coupling to tighten or loosen. PUSH DOWN ON BAIL AND UNLATCH THE HOOK FROM SIDE BAIL (small hook will fall away automatically) TO RELEASE FROM TUBE OR CASING. To elevate casing push lifter into pipe and push firmly on main bail: the small latch will fall away (come unhooked). This will allow the internal spring in the lifter assembly to force the slip elements out to the casing wall. Now as you pull up on the main bail the lifter will expand out harder and harder on the casing wall. When you want to release the lifter take weight off the casing string and push down on the main bail of the Lifter and latch the small hook on the small side bail. This will hold the lifter in the release position and it can now be lifted out of casing in order to go get the next piece of casing. The TekMark Heavy Casing Lifter has a capacity of 70 tons static load and an individual lifter can be converted from any size to another size with a “conversion kit” which is composed of a different sized wedge and a different diameter adapter plate. This tool allows the driller to install casing without welding lugs onto casing and then having to cut the lugs off again. 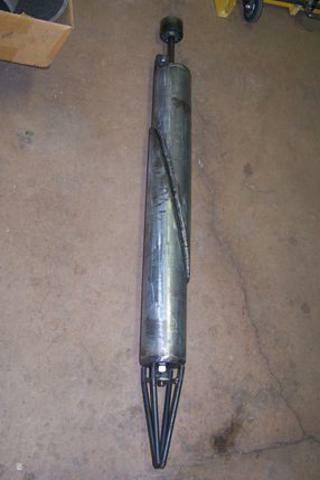 It saves both rig time and labor and is safer than conventional casing lifting methods because there is nothing protruding from the casing diameter while casing is being elevated and lowered.